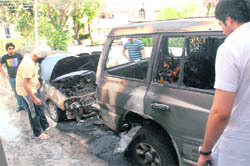 Four days after a group of students opened fire on a rival group, the same group (SOPU) allegedly burnt a Pajero and a Maruti Esteem car belonging to PUSU president Udey Singh at his Sector 11 house in the wee hours of today. The MC today came in the firing line of a team of the union government for its failure to effect certain urban reforms to become eligible for grants under Jawaharlal Nehru National Urban Renewal Mission (JNNURM). In order to lay a road map for implementation of reforms and projects under the Jawaharlal Nehru National Urban Renewal Mission during the year 2010-11, a meeting was held with eight northern states/UTs here today. The son of a humble Punjab government peon, Barinder Thapa, a class 8 student, got admission to the city’s prestigious St John’s School in Sector 26 under the reserved category for economically weaker sections. On the other hand, Divir Gupta, a class 10 student in the same school, is an IAS officer’s son. About 60 fresh cases of diarrhoea have been reported in various government hospitals across the city. The total number of gastroenteritis cases has reached 190. The onset of summer has heralded shortage of water and power. Due to the replacement of water supply pipeline in Sector 33-34 roundabout near Gulati Bhawan today, there was no water supply for the whole day in the sectors. The sectors include 20,21 C and D, 30 to 34, 44 to 47 and Industrial, Phase I and II. 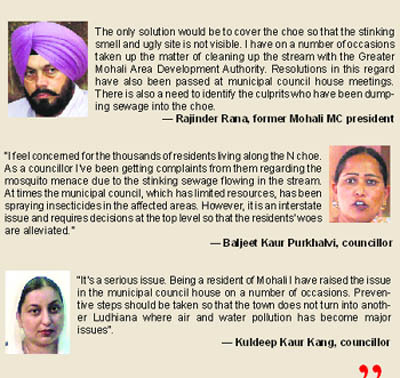 All is not well with the land pooling scheme of the Greater Mohali Area Development Authority (GMADA). The prospective applicants need more clarifications about the commercial plots being offered under the scheme. The Housefed Flat Sangarsh Committee lamented that officials in the Housefed were not keen on early completion of its project in Sector 79 here. Tension prevailed in Gazipur village when residents of the area today learnt that they were being displaced of the land on which they had been living for years. Even as certain councillors are on a “forced holiday” in the hills, away from the scorching heat to prevent them from being won over before the elections to the posts of president and senior vice-president, the administration has fixed April 15 as the date of the poll. 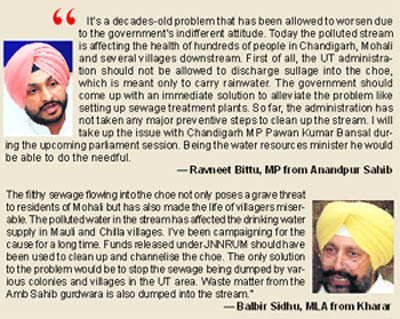 When it comes to prevention of water-borne diseases, the Chandigarh as well as Panchkula administration are no different. Both have failed to keep a check on the out break of infections, including cholera, resulting in deaths despite tall claims of agencies concerned of taking appropriate steps in this regard. 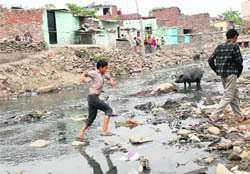 A boy wades through muddy water of nullah along the Rajiv Colony in Panchkula. 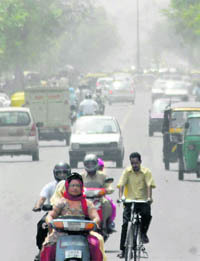 Tribune photograph: Manoj Mahajan. The Gujarat government has invited Gujaratis from across the world to converge on Gandhinagar and Ahmedabad to participate in the 50th anniversary celebrations of the formation of Gujarat. 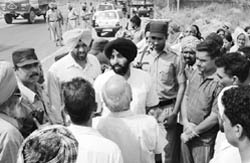 Chandigarh, April 12 Resentment prevailed among residents of Colony No 4 with regard to the UT administration’s decision to reduce the entitlement of kerosene oil for ration cardholders from 15 litres to 10 litres. Dr Vikas, senior resident of PGI’s Anaesthesia Department, who was accused of molesting a patient’s wife earlier this month, today, tendered his resignation. 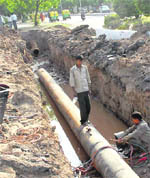 To avoid delay in completion of major projects, the Chandigarh Municipal Corporation, in a shift from earlier policy, has decided that in future, steel and cement for construction works, will be purchased by the contractors to whom the work is allotted from certified companies of Rashtriya Ispat Nigam Ltd (RINL). The decision was taken at the Road Committee Meeting, which was held under the chairmanship of Resham Chand Jakhu today. 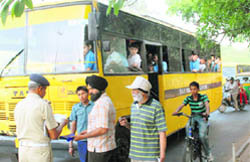 The city’s commuters will have to shell out more for travelling in local buses with the proposed increase in Chandigarh Transport Undertaking (CTU) fares likely to come into effect from Tuesday. According to home secretary Ram Niwas, the UT administrator has approved the hike and its notification is expected on Tuesday. Expressing their resentment on the issue of poor internal assessment awarded to them, students of department of English and cultural studies, Panjab University, today appealed to the Vice-Chancellor to intervene in the matter. In a blatant violation of a Central Vigilance Commission directive, the UT administration today not only took a cognisance of an anonymous complaint filed against a local government school principal, but even marked an inquiry against her. If the track record of student parties of Panjab University is any indication, nearly all presidential candidates belonging to two prominent parties - the Student Organisation Panjab University (SOPU) and Panjab University Student Union (PUSU) have either indulged in major acts of violence or have been framed by the rival party. Nitin Jindal, who is expected to return to the city on Wednesday, has appealed to the Panjab University Vice-Chancellor today to permit him to appear in the examinations starting on April 16. The traffic police today booked 149 school bus drivers during a special drive to check traffic rules violations committed by them. A scooterist was killed on the spot when he had a head-on collision with a speeding truck near Kajal Majra chowk on the Bassi Pathana-Nandpur Kalour road this evening. Beant Kaur (30), a resident of Chuni Kalan, today committed suicide at her in-laws’ house by hanging herself with ceiling fan. Her in-laws noticed the body and informed her parents. On the complaint of her sister Kanwaljit Kaur, the police has registered case under Section 306 of the IPC against her in-laws. E-max Group of Institutes, Badhauli village, held its annual athletics meet. Students from various institutes participated in the meet. Former Olympian trap shooter and Arjuna Awardee Gurbir Singh Sandhu today heaved a sigh of relief, as the court of CBI Magistrate JS Sidhu granted him bail. Thieves decamped with cash and goods worth lakhs of rupees after breaking open two showrooms besides making an attempt to loot a nationalised bank in Sector 11. The police booked a resident of Bapu Dham Colony (BDC) for allegedly attempting to commit suicide by cutting his vein. “Nobody is responsible for my death. It is my own decision,” this is what 47-year-old Narinder Jain wrote in his suicide note before he ended his life. He had been suffering from multiple ailments for the past nearly 14 years. After the Indian Premier League, it’s the Queen Baton Relay (QBR) of the Commonwealth Games, 2010, which is all set to sore the sports spirits of the residents of the City Beautiful again after two months. 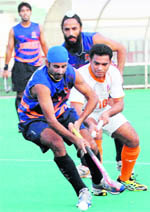 The ONGC-A team, which had allegedly made it to the final with unfair means in yesterday’s match against ONGC-B team, today lost to Indian Oil Corporation (IOC) by 2-3 in the final of the PSPB Hockey Championship at the Hockey Stadium, Sector 42, here today. Avilash Mishra moved to the next round after trailing Kabir Manrai 6-1, 6-1 in the first round of the boys U-12 singles’ category in the All-India Tennis Association Championship Series here today. The local players bagged the third position in the 55th School Games National Choi Kwang Do (U-19 girls and boys) Championship which concluded at War Heroes Stadium, Ambala Cantt, today. The city wrestling team has brought laurels to the city by emerging as the overall champions in the Fourth Senior Alysh Wrestling Championship organised by the Alysh Wrestling Federation of India in New Delhi from April 9 to 11.